Thanks, Ameena (one of my favorite Randoms in all the world)!! Silver Lining– a prospect of hope or comfort in a gloomy situation, according to the free dictionary. 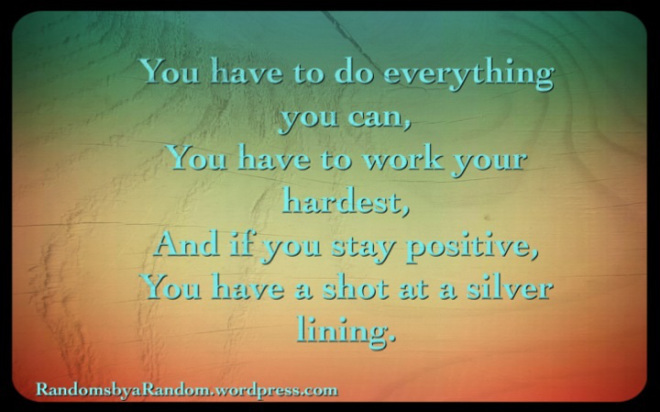 The above quote is from the oscar nominated movie, The silver lining playbook and I chose it for this week’s writer’s quote because today is Monday and we all need all the positivity we can get. “You have to do everything you can, you have to work your hardest”– this is the baseline towards success, giving it your best shot and leaving no stone unturned. Personally, I find a certain level of comfort in knowing I did the best I could. It helps me sleep better at night and I look towards the next obstacle knowing the previous door closed for reasons other than my efforts.